The cosmos is a vast realm of primal powers, alien empires, and wonders and dangers beyond imagining. 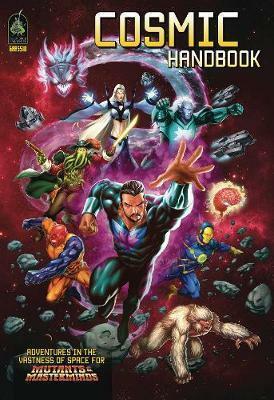 Now it is yours to explore with The Cosmic Handbook for the Mutants & Masterminds Superhero Roleplaying Game. This sourcebook looks at the universe beyond Earth, from the history of the cosmic in the comics to the conventions of cosmic stories and characters. In its pages you will find advice and rules for creating characters and adventures in the depths of space. GMs get ready-to-use villains, from space tyrants and aliens to nigh-omnipotent cosmic beings, and an expanded look at the universe of Freedom City and Emerald City beyond the bounds of Earth. Get ready, heroes, infinity awaits!